An antecedent intervention listed above that is particularly easy to implement in the classroom is the high-probability sequence (High-p). High-p is used to build behavioral momentum in order for a student to comply with a demand or instruction that has a history of low compliance. It entails asking the student to perform three to five simple tasks that have a high probability of compliance, followed by a direction that has a low probability of compliance. For example, if a student has a difficult time picking up toys (low probability task) then high-p can be used to build momentum using compliance with easy tasks. It is important to select tasks the student can already perform and that take up very minimal time (1-3 seconds). Using the cleaning up toys example, you could say to a student, "Give me a five! Spin in a circle! Wiggle your body! Now lets clean up our toys." This sequence of requests began with three easy to follow and fun tasks that had a high probability of compliance, followed by one task with a low probability of compliance. As mentioned earlier, the goal is to build behavioral momentum to entice the child to comply. Another antecedent intervention mentioned above in contriving motivating operations. This can be done by creating satiation or deprivation states that either increase or decrease the effectiveness of reinforcement. For example, if you have observed that every time your class goes to the library Sean runs to the computer and begins playing games and a verbal struggle ensues when he is told to leave the computer, then Sean's motivation to use the computer can be altered. This can be done by allowing him to use the classroom computer to play a computer game of his choice five to ten minutes before going to the library. This will create a satiation state in which Sean has had enough access to a computer game so when he goes to the library it is no longer reinforcing for him to use the library computer. Contrasting this, a deprivation state is one in which the individual has not had access to a particularly reinforcing item for a prolonged period of time, thus increasing the effectiveness of the items reinforcing value when it is presented. Finally, choice is another antecedent intervention that can be implemented prior to a behavior occurring. If a student often displays defiant behavior when presented with a worksheet, giving him a choice between two or three worksheets can present a novel situation in which he feels control over his actions. This may increase his compliance with completing work during independent work time. 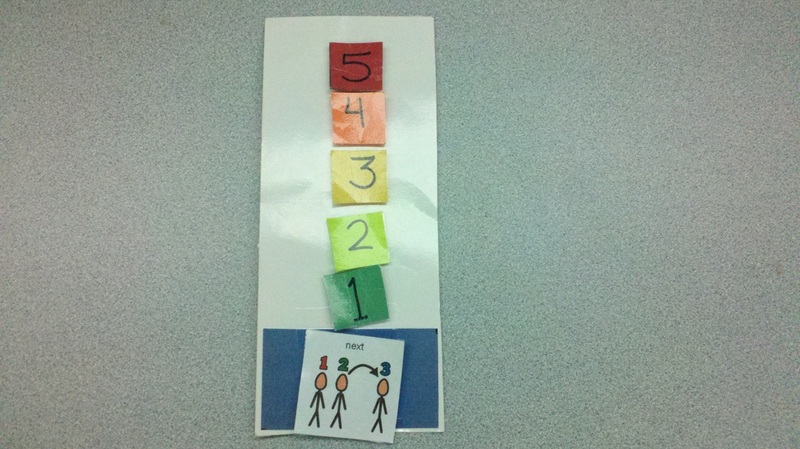 The following picture is of a countdown visual used for transitioning. This visual support is an antecedent intervention used to prime the learner for the upcoming transition. Each number is attached with Velcro and is removed as the transition nears. There does not need to be a specific time between removing a number, but a recommendation is to give the student more time ahead of the transition in the beginning stages. 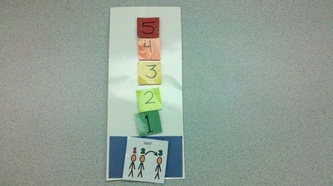 An example of a verbal direction when presenting the countdown is, "When I get to one we will go to our next activity."